I was delighted to receive this testimonial from a recent client and she asked that I share it with you. Take a read of this fascinating story about her aging cat so that you can see first hand why animal communication is so important. 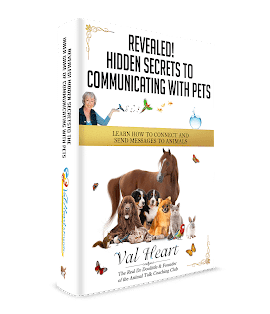 I contacted Val after reading about animal communication. I have lost many cats, during my years as a pet lover, and all of them have left me feeling devastated with a long period of mourning and unresolved feeling of guilt anger, sorrow. I read that it was important for animals to choose when they will pass away when they have to pass away, and that often times they needed to say goodbye to their companions, had last messages to give etc. I decided right then and there that I needed to learn AC, so when my other pets pass, I would honor their wishes. I searched the web, and found Vals’s website. I enrolled in Val’s, Basic and then Advanced Communication Course (really exciting and fascinating info). I also enrolled the AC Coaching club, to practice my skill, and by the way, have met a great bunch of like minded souls, who believe in AC. I wasn’t alone. The time came when my 18 year old cat, named KC, who was in end stage kidney disease, and had a large lump on her neck, which later spread to her chest, after we came from vacation. stopped eating and drinking, and wouldn’t come to me. I thought this is it, and my heard flooded with sadness, she is ready to go. My heart filled with sadness, and I was grief stricken once again. I called Val up to have a consultation, to find out if it was KCs time to go. She “opened up” the channels of communication between, herself and KC, me . We talked about my feelings about hers passing away.. She tuned into KC, who said that it was not her time to go. We decided that we should come up with a “signal” so that we would know when it was time for her to put to sleep. The signal was that she would put her paw on my hand, when she was ready, something she never did before.After, that, Val gave me some important messages from KC…don’t mourne me before I am gone, just be with me; It is up to me to determine, when I will pass..etc. At that point, all of a sudden I felt a deep sadness, but something I never experienced before…acceptance, love, sadness, but also respect and a “oneness” with her. KC rallied back and she has good days, and bad days.We had about 3 weeks together. During this time, my ability to communicate with KC, had improved greatly. We spent the time “being with each other” although it was tough seeing her wither away before my eyes. The day before she passed, We took our last walk together. She walked further than she had ever.She said that” you need to enjoy this too; feel the earth beneath your feet”. I picked her up some of the way. She wanted to go to the house next door, that had been put up for sale. Why? “She wanted to go an adventure for the last time” We took our time, as she sniffed and chewed the grass, took in nature’s scents. .. When, she decided to return, she wanted to walk back herself. The next morning, When I woke up, I got up to feed my other cat,and KC, some food, but she wouldn’t eat. She was curled up in a ball just looking at me. I told her that I was going back to bed for an hour. When I woke up, she looked at me, meowed, got up and walked over to me quickly, and walked over my hand, then turned back to sit down, I said” KC, are you trying to tell me that this is your time, or did you just walk on my hand by accident”? As she turned away to lay back down, I put my hand next to her paw, and she quickly touched my hand again then quickly collapsed.. I think it took every ounce of strength for her to give me that signal, because after that she could not life her head.. She said “this is it”. I asked her why she waited so long and she said “I needed to leave on my own terms”. I couldn’t believe she gave me the signal. Not Once buy twice!!! On the way to the vet, I held her in my arms, while Janet and I talked to her, about all the different memories, we had of her. When it was her time to go, I just caressed her, as the tears came down, and told her that she could leave, that I would be okay, and to promise to come back to me to tell me that she was alright….She thanked me for loving me and supporting her, allowing her to go on her own terms. I still miss KC, but, I am not blinded by grief, anger, to the point of being “incapacitated,” like I was prior to working with Val.. Instead, I am at peace with her transition.., I honored her last wishes Her gift to me to was to impart significant life lessons. Now, when I feel sad, I have wonderful memories to draw upon, to make me feel better. I know that I will be able to communicate and her and my other pets that have passed away. KC’s transition, and everything that transpired,was a life changing, affirming moment for me,thanks to Val. If you are dealing with an aging pet, that has health problems, or want to communicate with your pet about transitioning or if you are grieving an animal that has passed away, Val can help you. She is genuine, sensitive, and has a sense of humor that you can’t help but smiling. at. Her ability to connect with animals is “uncanny”. Give Val a call. She changed my life. I am confident that she can change yours,” if” you are open to it. P.S This is my first and only testimonial I have ever written…that says a lot! Great read. Ensuring your cat feels content as it ages will benefit its health and keep him/her comfortable.